The Argentine Open - the most coveted trophy in the polo world - is underway. Saturday, November 15, 2014, marked the start of the 121st Argentine Open. The tournament, held every year at the Campo Argentino de Polo in Palermo, runs until December 6, 2014 and brings together the best teams, players and ponies across the globe. Organised by the Argentine Polo Association (AAP), the Argentine Open of Palermo is considered the world’s most prestigious polo tournament. Together with the Tortugas Country Club Open and the Hurlingham Open, the Argentine Open form the famous Argentine Triple Crown, one of the most spectacular and eagerly awaited fixtures on the annual polo calendar and reserved exclusively for teams with a 28 to 40-goal handicap. As the fifth-oldest polo competition, the Argentine Open is one of the most important international championships at club level, running since 1893. It was initially named the River Plate Polo Championship and acquired its definitive name in 1923 when the River Plate Polo Association became the Argentine Polo Association. Ever since, the Open of Palermo is held each year at the Campo Argentino de Polo in Palermo, a Buenos Aires district popularly known as the “cathedral of polo”. This year, Saturday’s programme saw defending champions La Dolfina claim their 21st successive victory, defeating Miramar 17 goals to 6. The following match that day saw La Aguada beat Magual by 12 goals to 10, in a very close-fought match. On Sunday, the first match resulted in Ellerstina Piaget beating Chapaleufu 16 goals to 12. In the final match of the weekend, last year’s Open finalists Alegria fought back from a shaky start to beat La Aguada Las Monjitas 12 goals to 11. 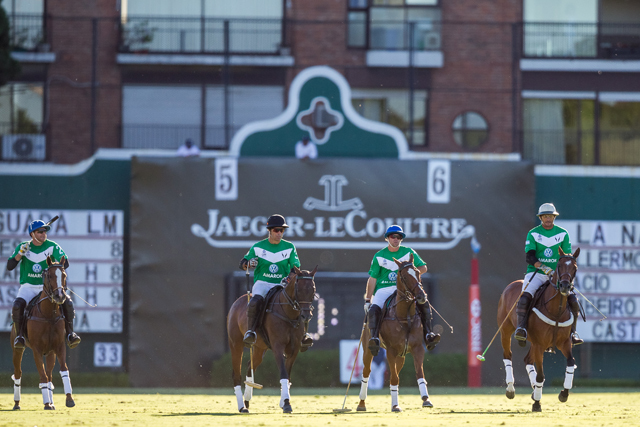 Jaeger-LeCoultre is the official sponsor of the Argentine Polo Open of Palermo. Luxuy watch brand, Jaeger-LeCoultre is the official sponsor of the 121st Argentine Polo Open of Palermo. The brand recently confirmed its commitment to the international sport by becoming the official sponsor of the Gold Cup for the 2015 British Open Polo Championship.